This summer, so far, has been filled with teacher-y stuff. I have been revising the Junior English curriculum to ensure that it aligns properly with the new Common Core nation-wide standards. It has been an onerous task and pretty dry. I can say that Junior English now looks a lot like Junior English of yesteryear. Blessedly, not much has changed. Most of our work was done on the computer and that was a challenge. I am not used to sitting in front of a computer for extended periods of time. The on-your-feet nature of teaching is much more my style. After hours of staring at a monitor I started to feel tired and my eyes started twitching. How do people in offices cope? Computers...pah! In my time working in the purely digital realm, I found some time to tap out notes on an IBM Selectric still lurking in the school library. It was a joy to unplug form the digital even if I was still plugged into an outlet. My interest in them has been piqued. That brings me to the picture above. 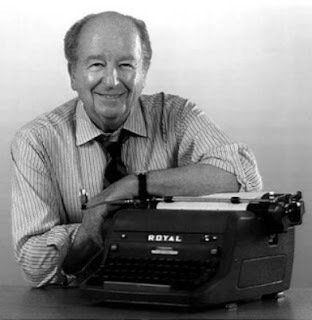 But in a news article from the San Francisco Appeal (an on-line newspaper) it appears if Herb Caen's typewriter will go up for auction to fund a SF Police summer program. Obviously, a worthy cause but it brings up some serious questions about Caen's typewriter provenance. This is a picture of Caen; the baldness, the smile. It's him alright, but the typewriter on which he jauntily leans is not an FP. It's an HH. Strange, no? 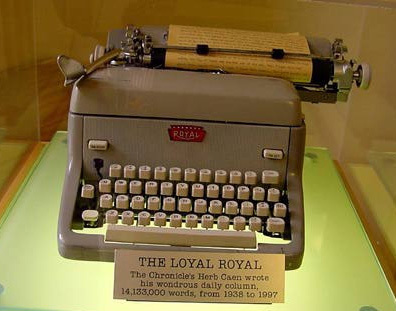 It would be perfectly reasonable for a columnist to have several typewriters and they both my be Royals, but if I was the SF Library or the soon-to-be auction winner, I would love to know which one was more loyal; the FP or the HH. As you can tell from the picture that heads this post, I have come into a fair few IBM Selectric type elements. I echo the title of this post and wonder what collective noun should be applied to such a gathering? Would they be a grip, group, cache, herd, mob, clutch, murder, dole, plump, balding, team, bed, ward, convocation, stalk, leash, skulk, leap, or an exultation? Comment with your ideas. With this new infusion of stuff I have become more and more interested in the IBM Selectric. Heretofore I have described them as "nice" and "not my thing," but as I spend more time with it I can see why so many people enjoy the company of this particular electric giant. I can remember a red one in the office where my Grandmother worked. I was allowed to use it whenever we visited. I–as many people–remember the sound of the motor gently humming while the element spun and bobbed across the surface of the paper. 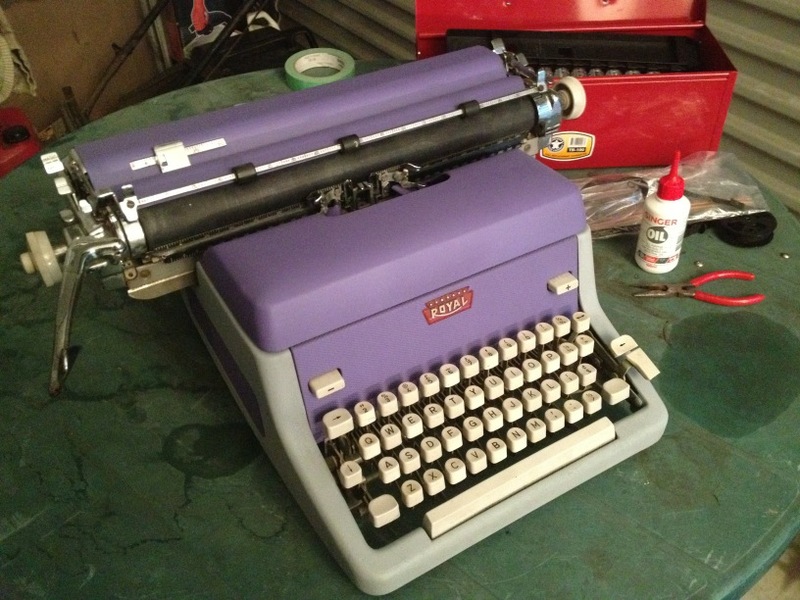 I have more ideas beginning to take shape around this very intriguing typewriter. In the mean time I have been neglecting the kindness of others. I should have posted a picture tonight, but I forgot. Absentmindedness does not diminish the kindness and generosity embodied in the lovely typewriter that Bill M. sent to me for use in the CTP. We have an identical brother to this particular typewriter and I know that it will be a welcome addition to the classroom. Thank you, Bill! 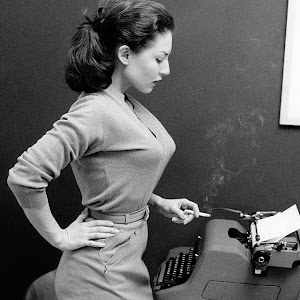 When I think about a typewriter, I think of a permanent device. Typewriters can last for decades. Some have been around for more than a century. It is a device with longevity. 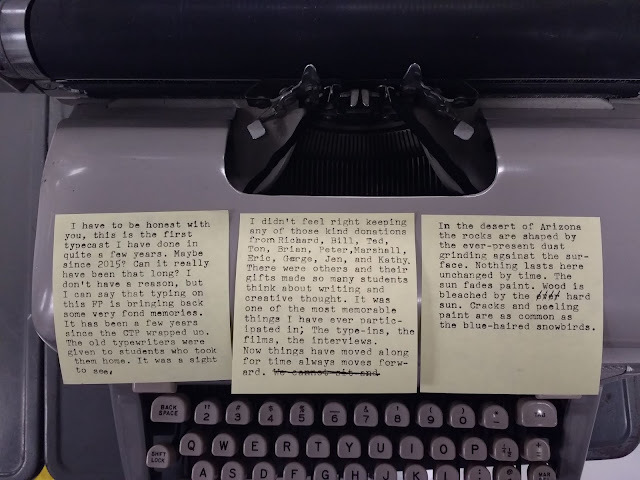 As rich as the experience of using a typewriter can be, the ephemera that belongs to the experience of using a typewriter can add an appreciative level of verisimilitude. Typing on real onionskin is a joy. Using carbon paper is so much fun. Using the original instruction manual makes you smile. These bits and pieces do not last forever. They are ephemeral. I find myself collecting these typewriter adjacent pieces almost accidentally. I see something at an antique store and I pick it up. Usually, I don't spend more than a few bucks. Over time it's easy to amass a large collection of this stuff. Typewriter ribbon tins are popular and I have enjoyed looking for those, but when I came across this on Ebay, I had to bid. I won it for a paltry $1.99 bid. It's a mending kit sent out as a promotional item. In this case Hi-Brand Office Equipment of North Hollywood wanted to give their customers something special. 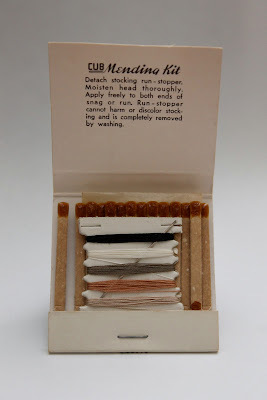 Sure, a book of matches was useful, but this little mending kit (mostly designed for women who wear stockings) would be the perfect thing to hand out to secretaries who were responsible for ordering supplies or had some pull over what typewriter brand the boss would buy. I like it because of the nice Olympia SG-1 on the back. So, enough show-and-tell. 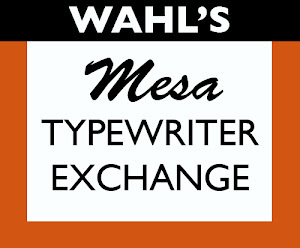 What are your favorite bits of typewriter ephemera? 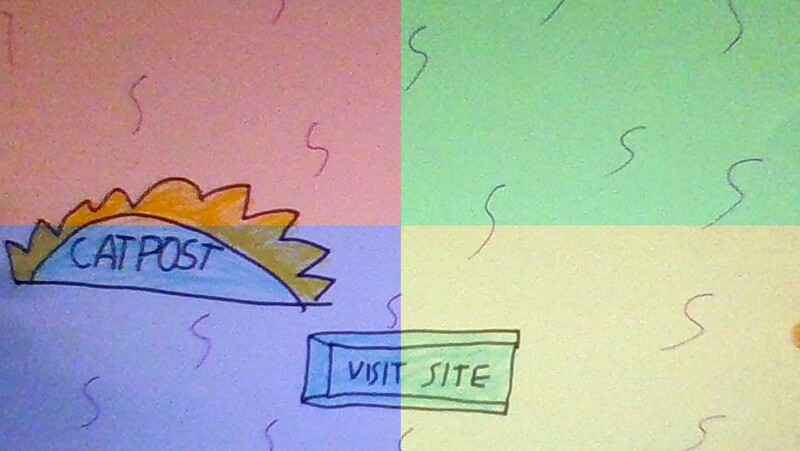 Mike (http://clickthing.blogspot.com/) has a Royal HH too. His differs in two respects. His has an elite typeface (mine is pica) and his also has a paper gauge. This handy little device lets you know when you have reached the bottom margin of your paper. Bottom margins have been the bane of typists since the dawn of typewriter time. While Mike's HH from 1956 has the gauge, my HH from 1954 does not have this feature. The odd bit: a palm tabulator with an FP. Scott's is a little broken, but it still works I'm sure. Maybe it was a custom thing or maybe Royal had a few extra pieces lying around. 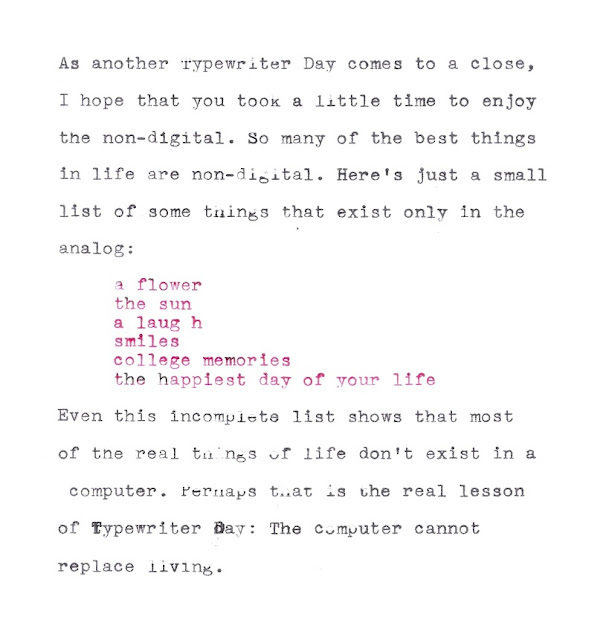 The more time you spend around typewriters the more you see these fun little things. 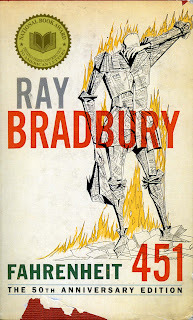 My Sophomore classes are reading Fahrenheit 451 by Ray Bradbury. 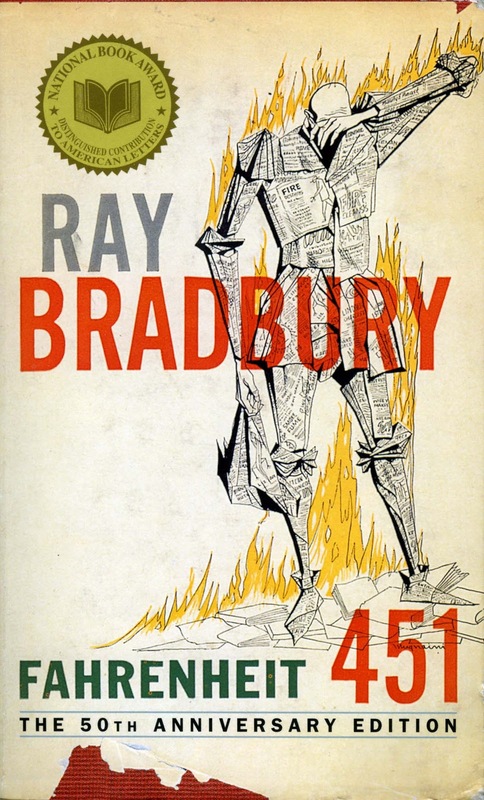 In the Afterword Bradbury describes how he considers F.451 a dime-novel. It cost him $9.80 in dimes to write at a coin-operated Remington or Underwood. He needed a place to type and the basement of UCLA's library prevented him from wanting to play with his children rather than working on his novel. 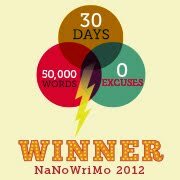 He indicates that the time constraint really helped him write. 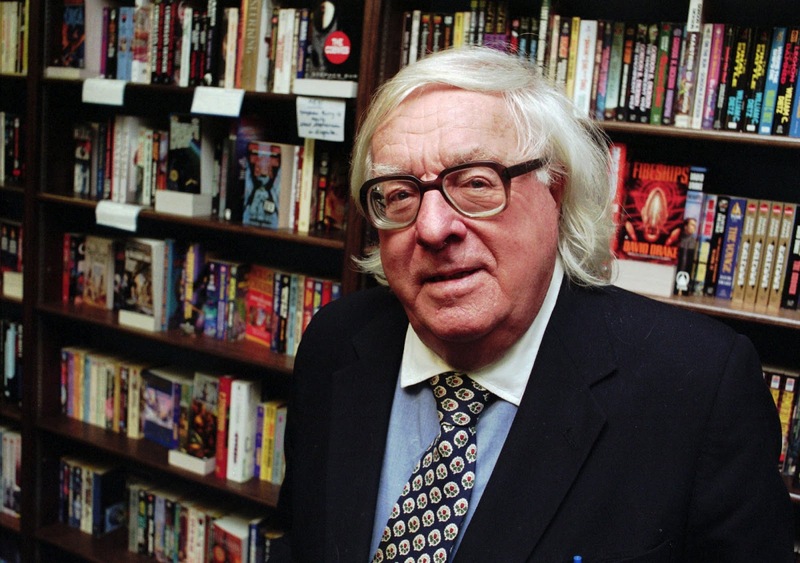 Born in Waukegan, Illinois in 1920 Ray Bradbury moved with his family to Los Angeles, California. He graduated from Los Angeles High School in 1938. He spent his days at home writing and his nights reading in the library. In 1947 a collection of his stories were published in a volume titled Dark Carnival. 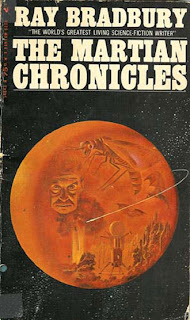 But it wouldn't be until The Martian Chronicles was published in 1950 that Bradbury achieved literary celebrity. What followed was a career filled with some of the most-read and most-enjoyed books of the late 20th century. Books like The October Country, Dandelion Wine, A Medicine for Melancholy, Something Wicked This Way Comes, I Sing the Body Electric!, Quicker Than the Eye, and Driving Blind captured the imagination of readers. All written on a typewriter. I started to investigate a little further. Based on what I found, Bradbury had at least two typewriters. One was a Royal KMM ( #3756210) from 1947. This particular machine is in the collection of Steve Soboroff. I emailed Steve and he let me know about the history of this typewriter. 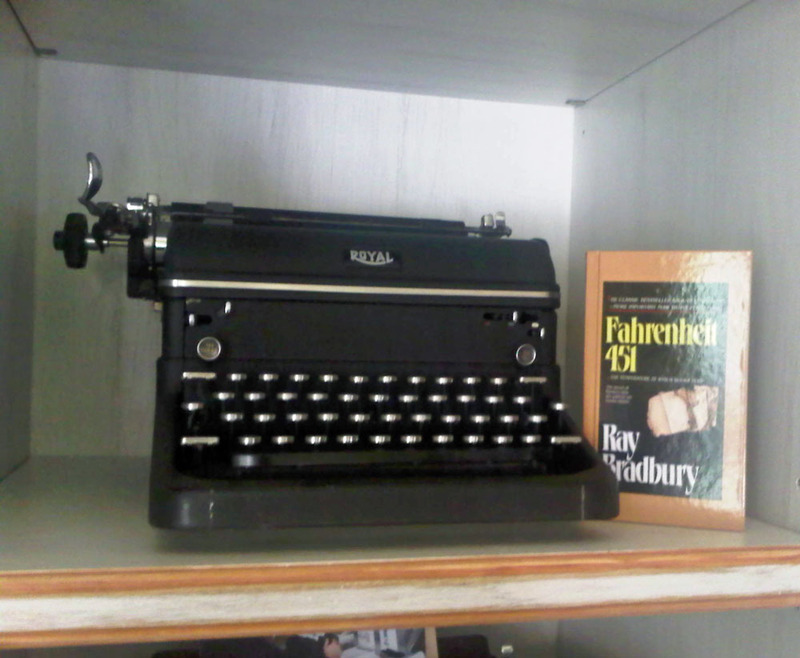 [This] typewriter was given directly by Ray Bradbury to a film documentarian who was completing a work on Ray. It was sitting on the floor of his cluttered study in his Beverly Hills home. He gave It to Dr. Elliott Haimoff, the documentary director and producer, as a memento. I purchased it directly from Dr. Haimoff. I have a photograph of the documentary crew with Bradbury taken on the day he gave away the typewriter. 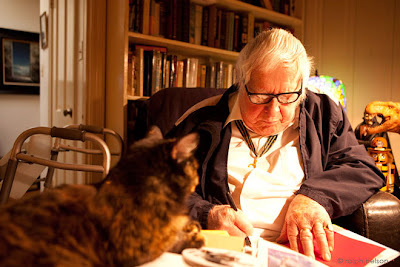 [The photo] was signed "to Elliott from Ray Bradbury". How absolutely exciting and special to have this typewriter in a collection, but Steve is well-known for his collection of exciting and special typewriters. The typewriter wasn't the end of the line. 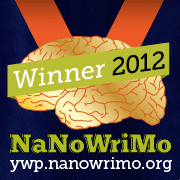 The typewriter embodied his entire world-view. As much as Bradbury wrote about the future, he was a staunch proponent of a far less digital life. It was only when his health dictated, did Bradbury alter his work flow. Up until my stroke, I used a typewriter. 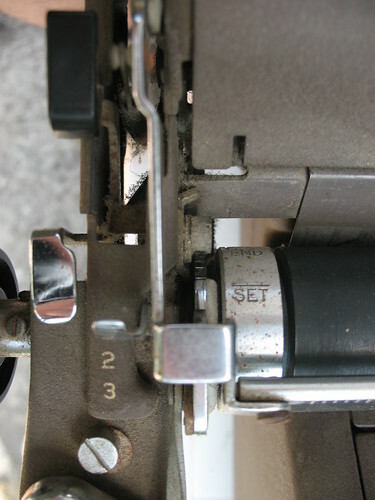 An IBM Selectric. Never a computer. A computer’s a typewriter. Why would I need another typewriter? I have one. 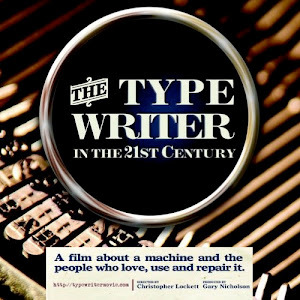 Bradbury inadvertently touched on the manifold reasons that we in the Typosphere prefer our typewriters. A single use device can be more efficient than something that can do everything. Is it any surprise that the the protagonist in Bradbury's perennial classic Fahrenheit 451 finds his own personal salvation –physical and spiritual– through a decidedly low-tech device; the book? Montag's entire world has been duped by technology and there are a precious few that realize that life is more than a digestion of technological junk-food. There is real nourishment out there and it can can be found outside the computer, outside the cell phone, and outside the television. Bradbury frequently depicts a society grappling with the unintended consequences of human actions and many of these crises are exacerbated by technology. For me, the most powerful images of technological skepticism in Bradbury's writing comes from "There Will Be Soft Rains." In this story, titled after an identically-named Sara Teasdale poem, we see the death and ultimate destruction of a very technologically advanced house. The owners of this home were killed in a nuclear holocaust, but the completely automated home has survived. Mindlessly, the house continues its daily program of cooking breakfast, cleaning, and serving humans who are long gone. The technology is a tool for comfort and without people it is meaningless and almost crass. High technology is a tool. The tool is relevant, but not as relevant as the person behind it. 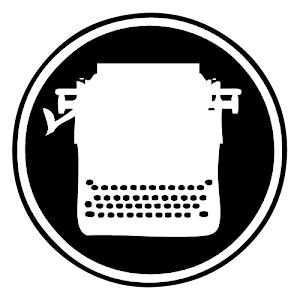 A typewriter is middle technology. The tools is relevant, but not as relevant as the person behind it. The latter is true. The former is not the case. A computer, a cell phone, a television have become the product and not the means. The speculative world of "...Soft Rains" or F451 where is slowly coming true. Bradbury's stroke left him unable to type, so one of his daughters would type his over-the-phone dictation on a computer and fax the print-out to him. He would then edit with pen and send it back for typing. 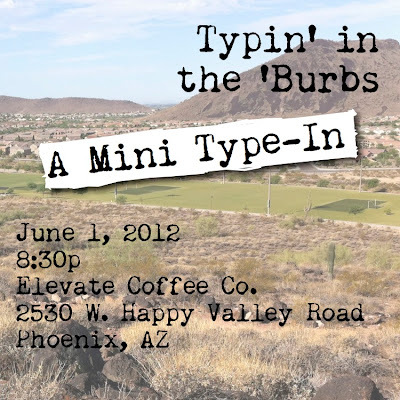 There isn't much more to say, so I'll end this post with the title; "I’d love to use my typewriter again. I miss it terribly, but it’s just not possible. So I get by." I am working on a small shadowbox project for our home office. This room is also known as the "typewriter room." This is the place where all my private collection typewriters are displayed. The room is comfortable and very usable, but is does need a little decoration. That's where these really nice typewriter ribbon tins come it. Before I was finished with the project I wanted to share some quick photos I snapped. This Carter's tin is my favorite. I love the star graphics. The Panama tins are beautiful with the airplane graphic. Ribbon tins are those fun bits of typewriter ephemera that add some dimension to the hobby. It must have been impressive to see all the varieties of tins stacked up in office supply stores. Now, they are a reminder of the way things used to be. Friday night was the Mini Type-In. Counting myself there was one other typewriter enthusiast. 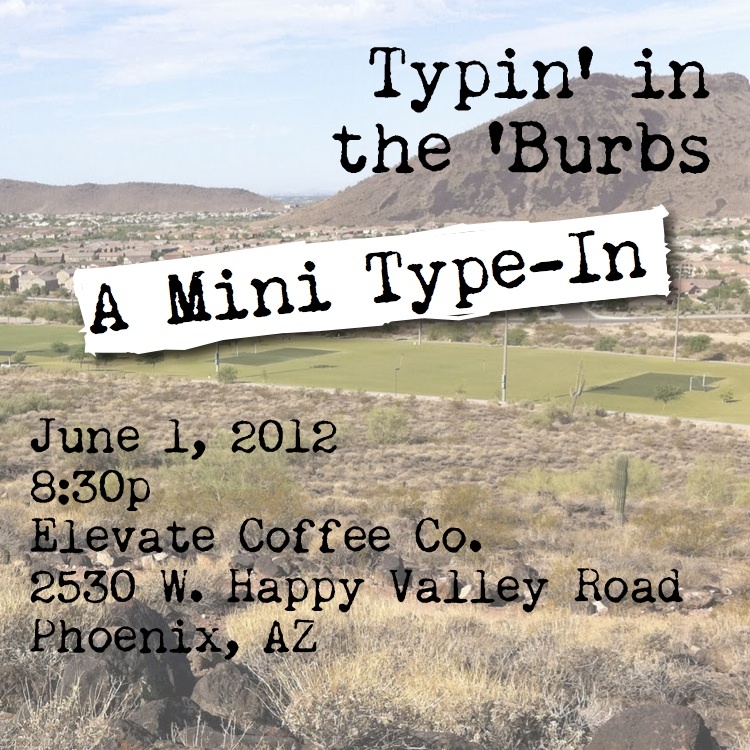 Bryan, who came to the 3rd Type-In at Lux, was kind enough to indulge my blabbering on and on about typewriters. I brought a mid-50s Smith-Corona Skyriter and Bryan brought a few Japanese-made Litton Royals; a Mercury and a Mustang. His examples are in great shape and it was a joy to have the experience of using them. With just two typospherians in attendance, the conversation was limited, but the conversation was interesting. So, was the mini type-in successful? Yes, just a little.